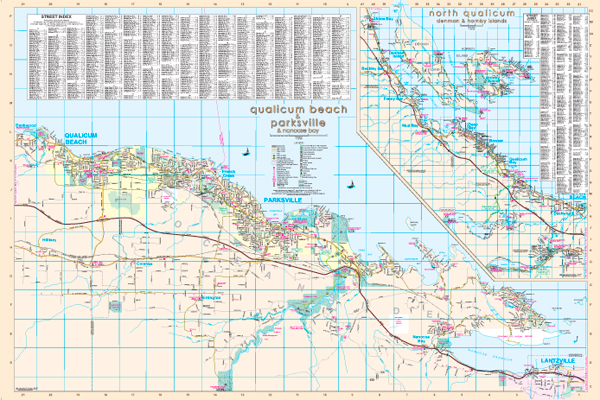 Parksville / Qualicum Wall Map 36" x 52"
The 2017 Parksville / Qualicum Wall Map continues detailed map coverage from the Nanaimo / Ladysmith Wall Map. Map coverage includes these communities as well as Nanoose Bay, French Creek, Errington, Coombs and Hilliers. The map includes Block Numbers, Parks, Golf Courses and Cemeteries, as well as locations for Schools - Elementary, Secondary and Private, Hospitals, Police Stations, Fire Halls, Libraries, Shopping Centres, Community / Recreation Centres, Points of Interest and Visitor Centres. Copyright (c) 2017 Davenport Maps Ltd. All rights reserved. Disclaimer.